Approach - We have no rights to ride a horse but responsibilities! The best relationship is not static as in a 50% partnership. Horsemanship instead is a dynamic dialogue where the strongest takes more responsibility towards the weakest, making up for that gap, without any expectations, punishment or judgement. In a genuine partnership, each party gives more than 50%, and there is no resentment or exploitation between the two. Any relationship needs contact and it’s based upon respect. No means always no, and we should never go beyond it. The evolution of horses has helped them to survive living in herds; horses are sociable animals capable of creating strong interactions with other members of the herd through a high level of empathy and refined shared feelings. A horse lives in the moment and anything that upsets its balance is addressed to other members of the herd. 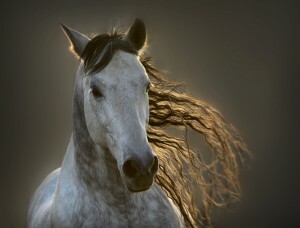 Horses feel and they are capable of understanding our emotions before we even begin experiencing them. There is nothing that they need to learn from us, rather something we need to understand and learn for ourselves. We have to learn how to feel and how to live the present when working with horses the same way other horses would. This kinesthetic dynamic model presents a high level of communication without getting into battles or confrontations with the horse, because “what is obtained by force and brutality will never be beautiful”. It’s a working relationship between the rider and the horse, who is the responsible actor performing through lightness and freedom of movement. On the other hand people have the need to control and to do more and more through gestures that block the horse having little meanings. Lorenzo strongly believes that there is not a bad horse and if there is, it certainly didn’t start like that. Some horses are easier than others but they all have something special. The role of the rider is to allow for it to happen. All horses have a tolerance area and provided you work within this area of tolerance they won’t resent you. On the contrary any work outside the range of tolerance (i.e. too fast or too slow, too soon or too late), will begin to damage the fine balance in the relationship. This causes the horse to use its natural defensive mechanism, showing an involuntary behaviour which most of the times is a reaction, an attempt to get rid of the hanger, a response to a situation which the horse is not capable of naturally understanding. This situation points out the problem horse! Lorenzo has not met so far a horse that he could not help. Improvements followed by great results can be achieved! This is not a matter of a quick fix visit. Every horse is an individual and every horse deserves respect. Horses don’t know the definition of time. Working with horses requires a degree observation, analysis and the ability to assess the right approach to every situation. This could take 20 minutes to an hour, to ½ a day or more!